If you are looking into home improvement or are a woodworker, then meet your new best friend, the Rockwell RK5141K 4.0A Sonicrafter F50 Kit with Hyper Lock and Universal Fit System, 34-Piece. The Rockwell RK5141K 4.0A Sonicrafter F50 is equipped with the Universal Fit system which means that you can fit into it accessories from other brands as well. What’s more, this oscillating multi tool is a wonder of a power tool. With the right accessory, it can saw, sand, grind, scrape, rasp or polish. Gone are the days of having to hoard a multitude of different tools for different jobs. Now with the Rockwell RK5141K 4.0A Sonicrafter F50 you can get most of your woodwork done with one small tool. Take the Fein FMM 350Q TOP 2014 Multimaster Top in your hand and switch it on. Without any noise, with such little vibration that you can barely feel it, you know this multi tool is the best of its kind. It certainly doesn’t hurt that it can cut through grit like butter and sand your wood into a gleaming polish in no time either. This is why the Fein FMM 350Q TOP 2014 Multimaster is out step up pick. The Chicago Electric Power Tools Oscillating Multifunction Power Tool is the king of all budget picks. It is true that this is a basic oscillating tool. However, this multi tool also comes with good reviews and is quite a bargain for the price you pay. Before you buy your oscillating tool, it is important to have a good understanding on what an oscillating tool exactly is and what it can be used for. What can an oscillating tool do? An oscillating tool is also called a multi tool. It is an all in one power tool which can be used for a multitude of functions. Unlike other saws, grinders or sanders, the oscillating tool is relatively smaller and is of lighter weight. As illustrated in this Wikipedia article, it has a blade which oscillates (i.e moves back and forth as opposed to rotating) really fast giving the tool the name oscillating tool. The word multi comes from the fact that it has multiple uses. As you will see below there are oscillating tools with the blade oscillating from 10,000 to more than 20,000 oscillations per minute, making it look as if the tool was vibrating instead of oscillating. As said before, an oscillating tool has multiple uses. These can be any of the following. The oscillating tool can be used for sanding wood surfaces smooth. Many plumbers use oscillating tools to cut plumbing pipes. By fitting the proper blade, a multi tool can cut through plastic, PVC, copper or galvanized metal as mentioned in this Popular Mechanics article. The oscillating tool can also be used to remove old paint, remove grout, cut under door frames, remove moldings or carpets, cut through drywall and grind mortar. Here is the criteria we used to determine the oscillating tools in our list. When we started curating our list, we wanted oscillating tools which were easy to use, light weight and tools of which the accessories were easy to change. If a tool had more than one accessory, they earned more points. Availability of accessories and whether anyone can use the tool also played a role. Let us be honest with you. When we saw the price of the Rockwell RK5141K 4.0A Sonicrafter F50 Kit, we were a little skeptic. How on earth can a power tool which can saw, sand, rasp, grind among other uses not be more expensive? But that was before we found out that the prices of oscillating multi tools in the market aren’t all that expensive compared to other power tools. Maybe it is to do with the fact that this power tool is much smaller than other power tools and you can basically hold it with one hand. Unlike other oscillating tools in the market, the Rockwell RK5141K 4.0A Sonicrafter F50 Kit has definite advantages. For instance, say you take your oscillating tool out of your house, but you forget to take your Rockwell accessories with you. If it was a multi tool of another brand, this would leave you rather bummed. But because you made the wise decision of buying the Rockwell RK5141K, you can now borrow your friend’s sanding pad and blade of another brand and fit them onto your Rockwell. This is because the Rockwell RK5141K has what is called the Universal Accessory Interface which accepts accessories of other brands. The inverse works as well. Rockwell accessories can be fitted on to other brand oscillating multi tools because the Rockwell accessories also have what is called the Universal Fit system. Two birds with one stone, and Rockwell wins hands down. But really, if you purchase the multi took lit, there is no need to look for another brand accessory as the kit comes with thirty four pieces for all your multi tool needs. Here’s why the Rockwell RK5141K is our personal favorite. When you use it, you don’t feel as if your hand is about to fall off because of the vibrations. The Rockwell RK5141K is equipped with a system known as the Vibrafree counterweight system which offsets the vibrations of the machine, making it much easier for anyone to use. If the above two reasons were not enough to make you want to buy the Rockwell RK5141K, here’s another reason why. The Rockwell RK5141K comes to you with the Tool-fee hyperlock system which makes changing accessories a breeze. For example, if you are metering a corner you would first use the saw, and then if you wanted to sand the cornice you would use the sanding blade. In the long gone days, this would take two very cumbersome tools. But now you have the Rockwell RK5141K oscillating multi tool. First you use the sawing blade. And then you press the easy release lever which in turn will loosen up the accessory flange. You take out the replace the sawing blade with the sanding blade in the blink of an eye. And because the blade is held in place with a clamping force of one ton, you never need worry about your fingers being sawn off accidentally. Because the multi tool comes with different power and speed settings you can choose the setting which suits your job best. Here’s something else we liked about this oscillating tool. It comes with an LED light which comes in handy if you have low light to work under or if you need to reach inside cabinets to dark places to saw or sand. In addition, the Rockwell RK5141K is also much less noisy than its competitors and is very stable to use. When you find yourself with a multi tool as good as the Rockwell RK5141K there are really no discernible flaws to speak of. After scratching our heads for a bit, the only flaw (if at all) we could come up with was the fact that this multi tool is a corded one and not a battery operated one. Which means that it is really not portable and can only be operated where there is a power supply. We would have very much liked it if the battery option was also there. But this is definitely not a deal breaker and the Rockwell RK5141K is our top oscillating tool pick. We were quite in love with our top pick, the Rockwell RK5141LK and weren’t really looking for a better option when we stumbled upon the Fein FMM 350Q TOP 2014 Multimaster. With this Fein, everything’s more. It’s more powerful, it’s more stylish, it’s more quiet and it’s way more expensive. Here’s why Fein is trustworthy. Fein is a pioneer in the manufacturing of oscillating tools and have been producing top quality tools for more than forty five years. Basically, there is no job that the Fein FMM 350Q TOP 2014 Multimaster cannot do. It can cut, sand, saw, grind and scrape. It can work on flat surfaces, in tight corners, on the floor, and in hard to reach areas. Just like our top pick, our step up pick also comes with an anti-vibration system which makes it easier to operate and puts less strain on the user. Because of the anti-vibration system, this multi tool also makes only a little noise. What’s more? The handle is ergonomically designed so that it fits your hand perfectly. It also has a soft grip zone which makes it easier for you to hold. Again, just like our top pick, our step up pick also has a tool-free accessory changing system called the QuickIN clamping system which makes for convenient accessory changes. This particular version comes in a bag instead of a box and have less accessories than its pricier twin. If you feel like paying more for a box is futile, then this is the Fein FMM 350Q TOP 2014 Multimaster to choose. If you had thirty dollars in your pocket and you wanted a multi tool for a quick job, buy our budget pick, the Chicago Electric Power Tools Oscillating Multifunction Power Tool. In no time you will have a new oscillating tool in your hands with spare change for a cup of coffee. We know it’s hard to believe. We raised our eyebrows when we saw the price too. It was almost too good to be true. But it’s good. And it is true. If you live in the USA, you might also get free shipping. If that’s not a great deal, then we don’t know what is. Let us see why this multi tool is very inexpensive and if the product is good for the price you pay. For starters, it only has one speed and runs at 21000 OPM (Oscillations per Minute). Secondly, the housing and gear are made of dye cast aluminum making it even more cost effective to manufacture. Thirdly, you might want to notice that even though the name is Chicago, this multi tool has been made in China. On the plus side, even though it has only one speed, it does come with three blades designed for various purposes. The Chicago Electrics Oscillating Multifunction Power Tool is also rather lightweight, weighing only 3 pounds and is therefore very easy to maneuver. Our budget pick is a good oscillating tool with which what you get is what you pay for. There is no flourish. It is a basic multi tool which is good for occasional use and to be used to at home. This certainly is not a tool for professional use. However, if what you are looking for is a basic multi tool for price that doesn’t put a dent in your purse, the Chicago Electrics Oscillating Multifunction Power Tool is the one for you. As we mentioned in the beginning, most oscillating multi tools in the market are really not that expensive. If you look at your budget pick, you can see how low a price a basic multi tool can fetch. Here we look at a few more oscillating multi tools which are on the low end of the price spectrum. In fact, its specifications are quite similar to those of our budget pick, the Chicago Electrics Multifunction Power tool. The Genesis also runs on one speed with 21,000 OPM and is made from die cast aluminum. But unlike our budget pick which only has nut and a washer to hold the accessories in place, the Genesis had a four-pin flange to do the job. When they sell you this multi tool they tell you what it’s good for. It’s good for sanding, sawing, scraping, and removing grout. This is also a basic oscillating tool that is perfect if you only have occasional remodeling or woodwork to be done. One of the drawbacks of this tool is that it is difficult to find blades and accessories which fit. Even though unlike our budget pick, the genesis will work with other brand accessories, ones which fit perfectly are hard to come by and when you do come across them, it might be a good idea to keep some in storage. Further, if what you need an oscillating tool which can be used for longer periods of time and frequently, then the Genesis GMT15A Multi-Purpose Oscillating Tool is not for you and you will be better off spending more dollars on a high end one. The Craftsman 2.0 Amp Compact AC Multi-Tool 23465 has variable oscillation rates from 11,000 to 19,000 OPM and is made in China. This means that unlike our previous budget friendly options, this multi tool has different speed settings to suit the job at hand. Something this oscillating tool has in common with our top pick, the Rockwell is that both of them have LED lights to be used when the visibility is low. When compared to pricier oscillating tools with better reviews, the Craftsman multi tool came lacking in a few departments. First, if not held in a particular way, the multi tool tends to overheat which is a problem that many users of this tool seems to face. Then there is also the noise to contend with. However, when all is being said and done, Craftsman has a reputation for manufacturing good solid budget friendly power tools. Even the overheating can be avoided on this multi tool if it is used gently and not forced to cut, letting the tool do its job. And this is an oscillating multi tool that even a professional can use without a problem. Portable cable is a known name when it comes to oscillating multi tools. One step above the budget friendly multi tools we have discussed so far, the Porter Cable PCE606K multi tool has a tool-free blade change system which can be compared with our top pick and our step up pick. It also has variable speed settings ranging from 10,000 OPM to 22,000 OPM. One point to remember if you buy the Porter Cable PCE606K is the type of blades to use. This multi tool uses only Porter Cable accessories and Porter Cable accessories themselves come in two designs, namely open blades with rectangular holes and ones with circular holes. This particular multi tool uses the first type of blades and if you are ordering separate accessories to go with the oscillating tool, remember to order the open design ones as the others will not fit. The Porter Cable PCE606K is a good, solid oscillating tool which can be used time and time again by both the home DIYer and the professional builder. We talked about a few oscillating tools which are very budget friendly. These tools are not your basic multi tools and typically come with many different accessories, blades and variable speed settings. They are also capable of performing more functions than the basic ones are. Most of these oscillating tools are manufactured by well-known brands who have already established a name in power tools, but there a few surprising new names in the list too. The first one on our more than hundred dollar list is the Ridgid JobMax R28600 3 Amp Multi-tool Starter Kit. As the name suggests this oscillating tool works on a 3 Amp motor and provides up to 20,000 OPM. The head of the multi tool can be adjusted in four positions giving you better access in tight spaces. This multi tool also has a tool-free accessory change system, an LED light to be used in low light situations and a two-fingered trigger which comes in handy when being used for a longer period of time. We have two Dewalt oscillating tools on this list. The DEWALT DWE315K is similar to most modern multi tools in that it features an LED light, a quick accessory change system (tool-free) and also comes with a 3 amp motor. Using this oscillating tool is easy. With this tool, you will not gauge the depth or height of your cuttings wrong because it comes with the Dewalt oscillating tool guide system. The oscillating tool also comes in a box with twenty nine accessories and pieces. Here’s why we like the DEWALT DWE315K. It’s stable. It also has a lot of power and the quick change system makes blade changes easy. However, if you want to buy separate blades, they can be quite costly. Yes, yes we know. We already have a Dewalt oscillating tool in the list. But we picked this Dewalt for a complete different reason than the other one. Remember the only flaw we could find with our top pick, the Rockwell multi tool, not being battery powered. With the Dewalt DCS355D1 oscillating tool, this problem has been solved. The Dewalt oscillating tool we talked about earlier, the Dewalt DWE315K is a corded multi tool. However, the DCS355D1 is lithium-ion battery powered. What does this mean exactly? There is no need of a power supply? It is portable. You can carry it in your backpack and get your sawing and sanding done like a magical handyman. This Dewalt oscillating tool is slightly more expensive than the earlier one. What good is a discussion on oscillating tools without taking about Dremel? Dremel is synonymous with multi tools and has been found to be very trustworthy. Unlike our other contenders which had up to 3.0 amp motors, the Dremel gives you an unbelievable 7.0 amp motor, which is why this multi tool is called hyper-oscillating. This tool also has a quick tool-less accessory change system. Because of the bigger motor giving you more power, this is the oscillating tool to pick if you want bigger jobs done. Therefore, this is one tool definitely for the professional. However, it is also good for regular home maintenance which require a multi tool. The Dremel VC60-01 also comes with a stability foot for the blade which makes it that much easier for you control the blade and have more accurate cuts. Everyone knows Bosch don’t they? Therefore it is really no surprise to find a Bosch in the oscillating tool market either. As with their other power tools, the oscillating tool by Bosch also proved that Bosch is a brand to be trusted. When we first took the Bosch MX30EC-31 Multi-X 3.0 Amp Oscillating Tool Kit is hand, we saw that it was good. To start off with, the switching on itself is not noisy and is what is called a soft touch switch. Secondly, you can tell that research has gone into making this multi tool as it is very user friendly. Even though it vibrates (as a result of the oscillation), the vibration itself is negligible and is not hard on the hands. The fact that you can barely feel the vibration with no kick-back means that there is no awkwardness or difficulty when trying to maneuver the Bosch MX30EC-31 Multi-X 3.0 Amp Oscillating Tool Kit in difficult places. It also means that there is minimum noise, making working with this oscillating tool a pleasure. Similar to many newer oscillating multi tools, this Bosch also features a tool-free accessory change system. One of the most appreciated things about this Bosch oscillating tool is that the power code it comes with is long. A problem those who work with power tools often face is the lack of access to an electric outlet and having a longer power code easily solves this issue. Another plus is the carry bag the multi tool comes in, with its own slot for the power code. This oscillating tool, manufactured in Switzerland is a good tool for the professional use. However even for the home user, you cannot go wrong buying the Bosch MX30EC-31 Multi-X 3.0 Amp Oscillating Tool Kit. Oscillating tools are an amazing piece of equipment you can have in your arsenal of tools which does a variety of jobs which would otherwise require a number of heavy power tools. From cutting to sawing, from sanding to grinding, from scraping to removing grout there isn’t much an oscillating multi tool cannot do. The prices of an oscillating multi tool can vary depending on the functions it can perform and the accessories it comes with. The most basic of oscillating tool offer one speed cutting while the best ones have variable speed settings, numerous accessories, easy blade changing facilities and so on and so forth. They are also low on noise and mostly vibration free. Our top pick, Rockwell RK5141K 4.0A Sonicrafter F50 Kit with Hyper Lock and Universal Fit System is we think very value for money. There is no doubt that the Rockwell oscillating tool a top-notch power tool which is handy for both the professional and the home owner. Thanks for your informative article which is helpful for anyone to choose the best oscillating tool. 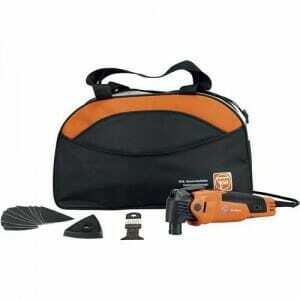 I like fein but price and noise is higher than other oscillating tool. Would you tell which tool is better within lower budget and higher performance ? All the information need is provided here. It’s very helpful for the buyers to decide which one to buy. Thanks author for providing so much informative article.